The use of cover crops dates back to ancient times. Over 2500 years ago, the Japanese and Chinese noticed that many crops grew and produced better following the growth of certain other plants. There is a finite amount of nutrients in soil, and with every harvest, nutrients are removed from the system and put into your vegetable or flower. This removal of nutrients and organic matter from the garden is what makes adding nutrients back into the soil necessary. Cover crops improve soil health because they add organic material and nitrogen, bring buried nutrients to the soil surface, break up hardpan soils, improve water percolation, suppress weeds, increase microbial activity and diversity, and reduce some soil pests. By sowing cover crops, you are essentially growing your own fertilizer in addition to improving soil quality! 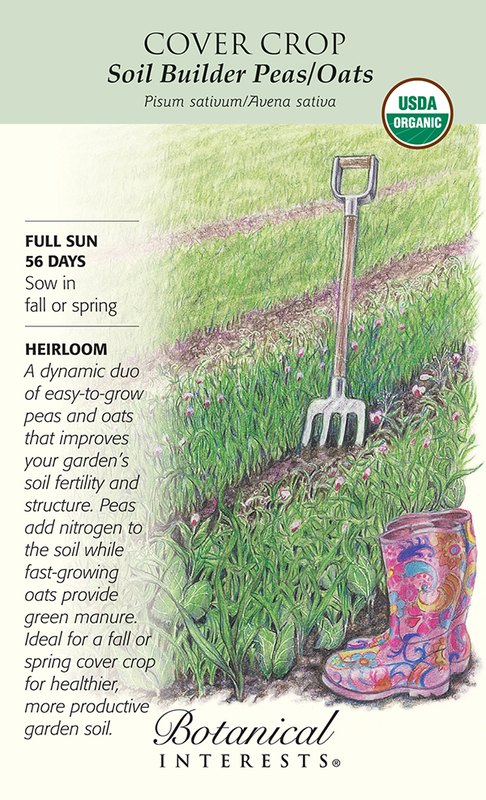 Soil Builder Peas/Oats: A dynamic duo of peas and oats that improves your garden’s soil fertility and structure. Sow in the fall, 6 to 8 weeks before your average first fall frost, or spring, when the soil is at least 40ºF. This hardworking combination of field peas and hulled oats is a legume and grass cover crop that quickly benefits the soil with nutrients and green matter, while helping suppress weeds. A great cover crop for established gardens, the mix is also perfect for improving areas being turned into gardens such as lawns and vacant lots. Pea plants fix nitrogen and condition the topsoil while the pea flowers attract bees and other beneficial insects. As an added benefit, the young pea shoots and tendrils are edible and can be used in salads or as a soup topping. Oats hold nitrogen, provide green matter, and provide support for the pea vines. Soil Builder is best grown as a fall cover crop but can also be grown in spring. When sown in the fall, the oats and peas benefit from the cool weather but are killed by the cold temperatures of winter and won’t regrow in the spring. The dead plant material provides a wonderful winter mulch that helps prevent soil erosion and is ready to be tilled into the garden as soon as soil can be worked in the spring. 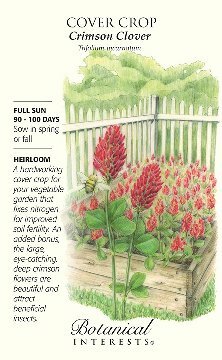 Crimson Clover: A hardworking cover crop for your vegetable garden that fixes nitrogen for improved soil fertility. Sow in the fall, 4 to 6 weeks before average first fall frost, or spring after the average last frost date. To sow, create a loose seedbed and spread the seed over the area. Gently rake the seeds into the soil so they are covered. This will ensure full contact with the soil and protect the seeds from hungry birds. You can till the crimson clover into the soil at any stage of growth but be sure to cut or mow it before seeds begin to form-just after flowering. In all but the warmest climates, the plant will be winter killed so you can also wait until the next spring to till it into the soil. 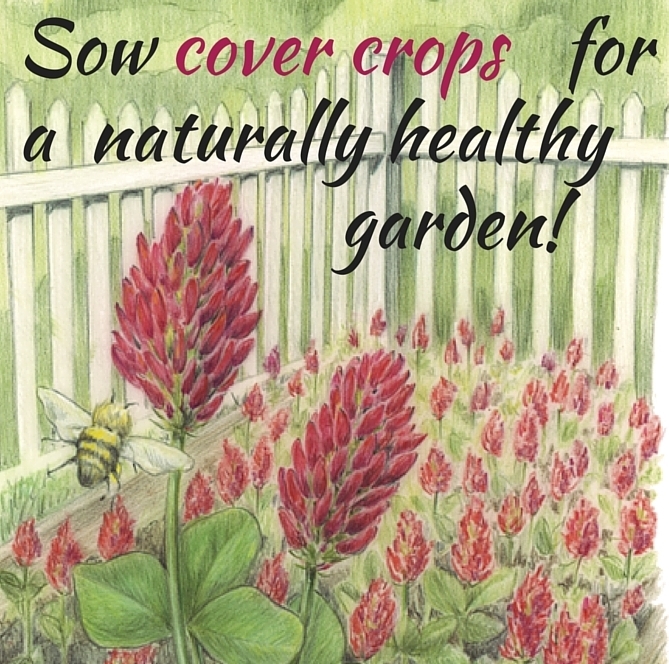 Crimson clover not only adds nitrogen to the soil, which improves fertility for next year’s garden, but it also attracts beneficial insects, such as ladybugs and bees. Don’t throw those flowers away, though. Make crimson clover tea! Pour boiling water over 1-2 tablespoons of dried flowers. Steep for about 10 minutes and serve either hot or cold over ice. If you like your tea sweet, add a splash of clover honey. 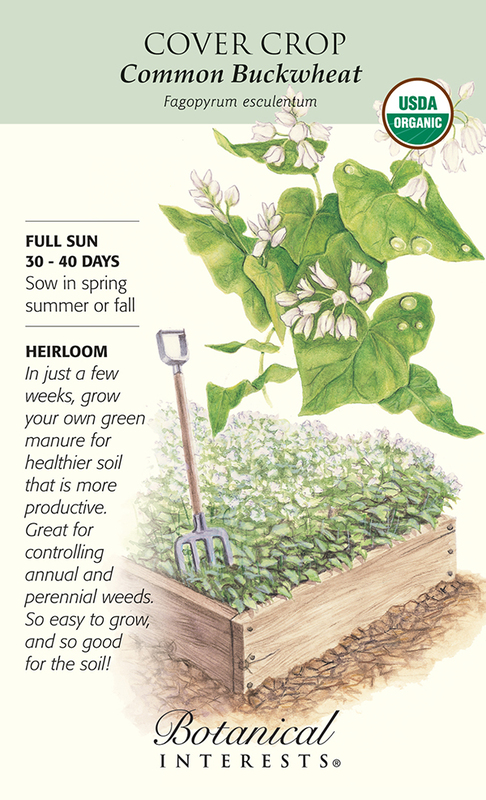 Common Buckwheat: In just a few weeks, grow your own green manure for healthier soil that is more productive. Spring through fall, when soil temperature is above 55ºF. Buckwheat not only improves your garden’s soil, this fast-growing plant is great as a “smother” crop to inhibit growth of common garden weeds such as lambsquarter, pigweed, thistle, purslane, and even tough quackgrass. Buckwheat grows in soils with poor fertility, and after germination requires little water; avoid wet soil and shady sites. Seeds sprout within days of sowing; plants grow quickly and are ready to till into the garden a month later. Unlike some other cover crops, the succulent buckwheat plants and fibrous roots are easy to mix into the soil with a shovel or rototiller. You can also leave cut plants on the soil surface as mulch. The white flowers attract many beneficial insects to the garden, especially bees that feed on the nectar to make delicious honey. A late summer sowing provides a wonderful food source for honeybees, since other nectar sources become more limited at this time of year. Flowers can also be cut and added to a fresh bouquet. Visit Hillermann Nursery & Florist for a great selection of Botanical Interests seeds including these featured varieties.